An amplifier is used to increase the amplitude of a signal, without changing other parameters of the waveform such as frequency or wave shape. Amplifiers are one of the most commonly used circuits in electronics and perform a variety of functions in a many electronic systems. The amplifier symbol gives no detail of the types of amplifiers described, it only gives the direction of signal flow and can be assumed as flowing from left to right of the diagram. different types of amplifiers are also often described in system or block diagrams by name. In the analog TV receiver, many of the individual stages that make up the TV are amplifiers. You can also notice that the names indicate the type of amplifiers. Some are true amplifiers and other amplifiers has extra components to modify the basic amplifier design for a special purpose application. Method of using relatively individual electronic circuits as building blocks to create large, complex circuits is common to all electronic systems. Computers and microprocessors are made up of millions of logic gates and other components, which are simply specialized types of amplifiers. To recognize and understand basic circuits such as amplifiers is an essential step in learning about electronic projects. Different types of amplifiers are available for different applications. An amplifier is classified by the type of signal it is designed to amplify. Usually refers to a band of frequencies that the amplifier will handle the function that they perform within an electronic system. Audio frequency amplifiers are used to amplify signals in the range of human hearing that approximately 20 Hz to 20 kHz. Some Hi-Fi audio amplifiers extend this range up to around 100 kHz ranges while other audio amplifiers may restrict the high frequency limit to 15 kHz or less. Audio voltage amplifiers are used to amplify the low level signals from microphones and disk pickups,. Etc.. By extra circuitry, amplifiers also perform functions such as tone correction, equalization of signal levels and mixing of different inputs. Amplifiers generally have a high voltage gain and medium to high output resistance. 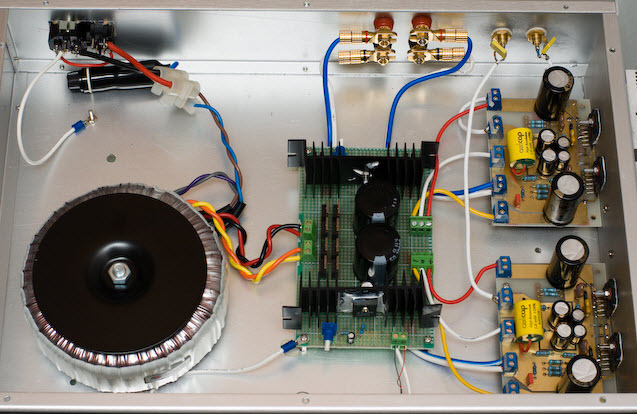 These Audio power amplifiers are used to receive the amplified input from a series of voltage amplifiers and then provide sufficient power to drive loudspeakers. Intermediate Frequency amplifiers are tuned amplifiers used in radio devices, TV sets and radar devices. The Main purpose is to provide the majority of the voltage amplification of a TV or radar signals, before the audio or video information carried by the signal is separated or demodulated from the radio signal. Amplifiers operate at a frequency lower than that of the received radio waves, but higher than the audio or video signals eventually produced by the system. The frequency at which Intermediate Frequency. These amplifiers operate and the bandwidth of the amplifier depends on the type of equipment that used. The AM radio receivers and the I.F amplifiers operate at around 470 kHz and their bandwidth is normally 10 kHz i.e. 465 kHz to 475 kHz, home TV commonly uses 6 MHz bandwidth for the I.F Signal at around 30 to 40 MHz and in radar a bandwidth of 10 MHz may be used. Radio Frequency amplifiers are tuned amplifiers in which the frequency of operation is governed by a tuned circuit equipment. 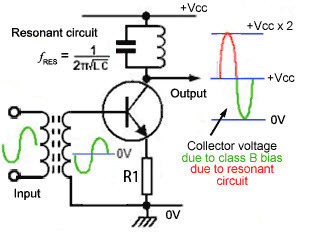 This circuit may or may not be adjustable depending on the purpose of the amplifier. Its bandwidth also depends on use and may be relatively wide or narrow. Amplifier Input resistance is generally low. Some RF amplifiers have little or no gain at all but are primarily a buffer between a receiving antenna and later circuitry to prevent any high level unwanted signals from the receiver circuits reaching the antenna port, it could be re-transmitted as interference. Feature of RF amplifiers is they are used in the earliest stages of a receiver and are low noise performance. Background noise generally produced by any electronic device, that is to keep a minimum because the amplifier will be handling very low amplitude signals from the antenna. It is common to see low noise FET transistors used in these stages. Ultrasonic amplifiers are a type of audio amplifier handling frequencies from around 20 kHz to up to about 100 kHz ranges. These are usually designed for specific purposes such as ultrasonic cleaning purpose, metal fatigue detection technique, ultrasound scanning purpose, remote control systems, etc. Every type will operate over a fairly narrow band of frequencies within the ultrasonic range. Wide band amplifiers must have a constant gain from DC to several tens of MHz range. These amplifiers are used in measuring equipment such as oscilloscopes. There is a need to accurately measure signals over a wide range of frequency range because of their extremely wide bandwidth and low gain. DC amplifiers are used to amplify DC (0 Hz) voltages or very low frequency signals where the DC level of the signal is an important parameter. They are common in many electrical control systems and measuring instruments. Video amplifiers are a special type of wide band amplifiers that also preserve the DC level of the signal and are used specifically for signals that are to be applied to CRTs or other video equipment used. Video signals carry all the picture information on TV sets, video and radar systems. Bandwidth of video amplifiers depends on use. In TV receivers it extends from 0 Hz (DC) to 6 MHz and is wider still in radar. Buffer amplifiers are a commonly encountered specialized amplifier type that can be found within any of the above category types, they are placed between two other circuits to prevent the operation of one circuit affecting the operation of the other circuit. They isolate the circuits from each other. Buffer amplifiers have a gain of one, i.e. they do not actually amplify the signal, so that their output is the same amplitude as their input wave, but buffer amplifiers have a very high input impedance and a low output impedance and can therefore be used as an impedance matching device. Buffer ensures that signals are not attenuated between circuit parameters, as happens when a circuit with a high output impedance feeds a signal directly to another circuit having a low input impedance. Operational amplifiers have developed from circuits designed for the early analog computers where they were used for mathematical operations such as adding and subtracting. They are widely used in integrated circuit form where they are available in single or multiple amplifier packages and often incorporated into complex integrated circuits for specific applications. 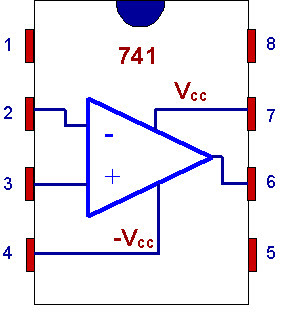 The design is based on a differential amplifier circuit, which has two inputs instead of one. These produce an output that is proportional to the difference between the two inputs. By without negative feedback supply, op-amps have an extremely high gain efficiency, typically in the hundreds of thousands. By applying negative feedback increases the op-amp´s bandwidth so they can operate as wide band amplifiers with a bandwidth in the MHz range, but reduces their gain efficiency. These simple resistor network can apply such feedback externally and other external networks can vary the function of op−amps. Amplifiers are used to increase the amplitude of a voltage or current or to increase the amount of power available usually from an AC signal wave. In every task there are three categories of amplifier that relate to the properties of their output. Classification of the amplifier can be done in 3 different ways. The main aim of a voltage amplifier is to make the amplitude of the output voltage waveform greater than that of the input voltage waveform, although the amplitude of the output current may be greater or smaller than that of the input current. The main aim of a current amplifier is to make the amplitude of the output current waveform greater than that of the input current waveform, although the amplitude of the output voltage may be greater or smaller than that of the input voltage this change is less important for the amplifier´s designed purpose. In a power amplifier, the product of voltage and current at the output is greater than the product of voltage x current at the input. Either voltage or current may be less at the output than at the input and It is the product of the two that is significantly increased. Different types of amplifiers also available in power amplifiers like class A, class B, class AB, class D. We can use these amplifiers in different electronic projects. For more information on amplifiers, types, working, applications and projects please refer to the link.